Home / / The Warrior's Rosary for Women - 7mm Blue Bohemian Glass Facete beads with Aurora Borealis effect. Crucifix and centerpiece are a two tone antique gold and silver finish with all the Our Father medals antique silver. Available in five different bead colors and combinations. 2. Item# WG08/7 7mm Amethyst Bohemian Glass Faceted beads with Aurora Borealis effect Crucifix and centerpiece are a two tone antique gold and silver finish with all the Our Father medals antique silver. 3. Item# WG09/7 - 7mm Blue Bohemian Glass Faceted beads with Aurora Borealis effect. Crucifix and centerpiece are a two tone antique gold and silver finish with all the Our Father medals antique silver. 4. Item# WG10/7 - Black Bohemian Glass Faceted beads with Aurora Borealis effect Crucifix and centerpiece are a two tone antique gold and silver finish with all the Our Father medals antique silver. 5. Item# WG15099A - 6mm Semi-Precious Stone Hematite. 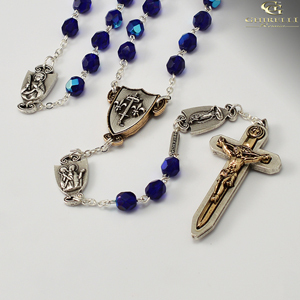 Crucifix and centerpiece are a two tone antique gold and silver finish with all the Our Father medals antique silver.